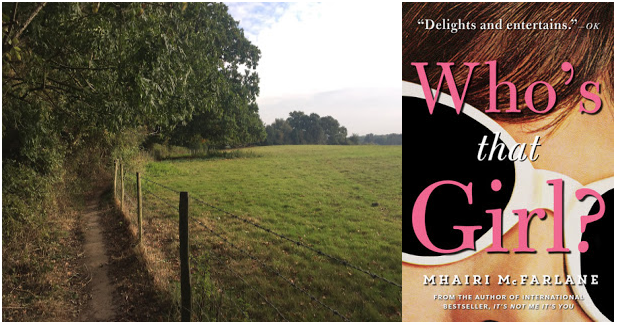 After recently reading Who's That Girl by Mhairi McFarlane, I came up with an idea to introduce a another kind of feature within Adventures in the Great Wide Somewhere. That being when I read a certain book that inspires me to travel to a new place or think fondly on a place I've been I will feature my review and emphasize the setting and why it makes me want to travel to said location! This week I'm talking about Who's That Girl and Nottingham, or to me, any small English countryside town. Mhairi McFarlane is a new author to me after Hannah recommended; she also gifted me this book and I immediately dove into reading. I was intrigued by the synopsis and once I started it, I couldn't put it down. The plot, the theme, the characters all made an impact on my heart but it was the setting and ambiance of the novel that really solidified it as a VIP read. After some horrendous workplace and cyber bullying revolving around an unfortunate situation at a wedding she attended, Edie moves back home to Nottingham to work remotely on a book with a famous actor who also happens to be from her home town. The description and setting of Nottingham is everything I love about the UK. The small town feel, the cozy houses, the pubs, everything that was talked about is why I love England. It reminded me of Hever, a small town I walked through to get to the castle. It was quaint and quiet and just beautiful. It was 100% a place I could see myself living and wishing I could just pick up and move. Nottingham gave me that feeling in book form! There's something so cozy and warm to me when I read about a place like this. It's like I can see it and feel it right in front of me. It almost feels like coming home to a place I didn't know I was homesick for. I love everything about England and this book solidified my feelings for this amazing island. It really packs a punch for how relatively small it is compared to other countries. In addition to the setting, the characters and themes stole my heart. Edie was a fantastic human. Imperfect but trying to do the right thing, she always tries to think of how her actions will affect other people and right a wrong. I loved her internal monologue and how she thought things through when people were treating her badly or when she was angry and trying to figure out what to do. I found her POV refreshing and honest. Cyber bullying is a huge theme in this book and it was quite painful for me to read at points. It was so well done in the respect that I can completely see this happening to somebody because people are awful. Truly terrible and nothing that was done surprised me. Having history with bullying and cyber bullying in the past, my heart absolutely bled for Edie and I wanted to lay hands on the people in this novel. It hurt my heart in so many ways and I hated how she was treated so poorly however I was super satisfied with how it all turned out in the end. The romance aspect of the story was really cute. I'm not a huge fan of the celebrity love interest but I still really liked how it all progressed. Elliot was slightly awkward and definitely not the macho guy actor stereotype. Though I did quite like that his claim to fame was a prince in a popular fantasy series--you know nothing, Jon Snow--so that was nice mental eye candy. Their banter and series of misadventures to get together was adorable and very entertaining. And while the setting is something my gypsy heart clung to, it was the overall arc of Edie's character that stole my heart. As with the other McFarlane novel I read, the journey she takes her heroines on is one every reader needs to experience. She really puts them through the ringer but within those struggles, the heroine always comes out learning more about herself and I think the reader does, too. I love that McFarlane's book opens up an internal dialogue with myself. I find myself being extremely introspective and self-reflecting while reading and thinking a lot about my own life choices. I also really appreciate that her heroines' arcs aren't just about a romantic happy ending, that's only a mere part of her characters' journey. I really cannot say enough about how smart her books are and how much I feel I learn about myself while reading. If you're looking for a book that will help you travel by page and self-reflect positively, this is definitely a book and an author you need to check out! And check out my quote feature Words Have the Power to Change Us where I feature my favorite quote below! "He's an irrelevant person. Learn to spot irrelevant people. Don't expect someone who doesn't know who they are to care who you are." I love this idea for a new spin on this particular feature on your blog! Can't wait to read more :) And I am excited for Who's That Girl? It sounds SO good, and I can't wait to check it out. Thank you!! That makes me so happy you like this idea!!! !